Vijay greeted his fans while shooting for his film with AR Murugadss and won hearts along the way. Now, there is some good news for his well-wishers. As it so happens, Vijay was recently shooting for his film with AR Murugadoss in Chennai. And, as expected, several fans turned up to get a glimpse of their favourite star. 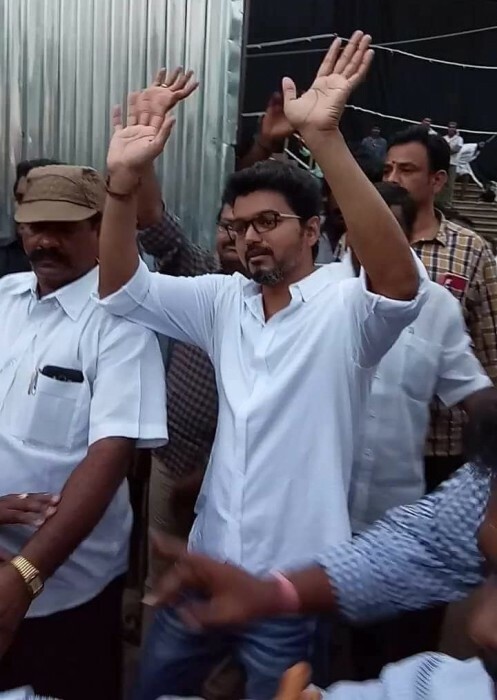 On keeping to know about this, Vijay waved to the crowd and made it clear that he is truly indebted to his well-wishers. Here is a video of the incident, which you can check out here. In case you did not know, Vijay and ARM have previously collaborated for films like Thuppakki and Kaththi. As such, fans are bound to have high expectations from their latest film. Last year, ARM had said that it deal with an important issue and feature ‘Thalapathy’ in a new avatar. “While doing Thuppakki, there was a bit of fear because I was making a film with a huge mass hero. With Kaththi, the fear was about matching up to the previous film. Now, it is all about what we can do that will be new? There is pressure, but I consider it as a challenge. It will be an unusual project and I want to show an unknown side of Vijay sir with this film,” he had told a leading daily. On a related note, ARM’s last release was Spyder. Released last year, it had Mahesh Babu in the lead and bombed at the box office. As far as Vijay is concerned, he was last seen in the Diwali blockbuster Mersal and received praise for his work.